My last segment in this series focused on Omada Health. This segment is on Jet.com. 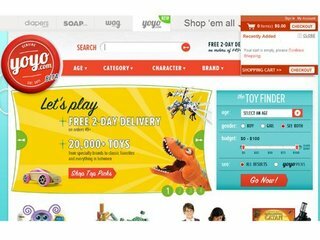 Screenshot of Jet.com in May 2014 via Wayback Machine. Founded: Jet.com was officially incorporated in April 2014. 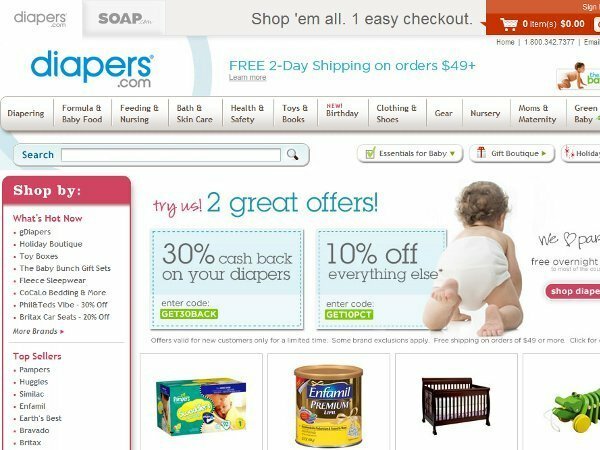 The founders hailed from Quidsi—maker of Diapers.com and Soap.com—which had sold to Amazon in November 2010 for $545 million. Though they worked at Amazon for a few years, the founders stepped down in July 2013, signalling that they had fulfilled their contracts and were prepared to launch their next big project. First funding - at three months from founding: In July 2014, Jet.com secured $55 million in funding led by New Enterprise Associates (NEA) with participation from Accel Partners, Bain Capital Ventures, and MentorTech Ventures. Other details were scarce, though Recode reported that Jet.com had already hired more than 30 employees (many ex-Quidsi employees) and had plans to launch in 2015. Traction - at seven months from founding: In November 2014, the company launched its Jet Insider program to offer rewards to Jet.com's earliest customers. Anyone who signed up received a free six-month membership. Additionally, Jet.com offered stock options to the members who referred the most people to the service. The top 10 insiders would receive 10,000 stock options and the top insider of all would receive 100,000 options. As of November 26, 2014, nearly 11,000 people had signed up for Jet Insider. First businesss model - at nine months from founding: In January 2015, Bloomberg provided a sneak peek at Jet.com's business model ahead of the company's limited launched planned for February 20. The e-commerce site would be much like Amazon, offering everything from books to electronics to clothes. But it wouldn't be free to use. Following a 90-day free trial, customers would have to pay $49.99 per year to access the company's marketplace. The idea was that Jet.com would be the digital Costco to Amazon, offering goods at 10 to 15 percent discounts in exchange for customers' membership and loyalty. “We’re basically not making a dime on any of the transactions," said Lore. "We’re passing it all back to the consumer." Third funding - at 10 months from founding: In February 2015, Jet.com raised $140 million in new funding. led by Bain Capital Ventures with participation from Accel Partners, Coatue, General Catalyst, Goldman Sachs, Google Ventures, MentorTech Ventures, NEA, Norwest Venture Partners, Silicon Valley Bank, Temasek, Thrive Capital, and others. The new funding gave Jet.com a valuation of nearly $600 million. New executive hire - at 11 months from founding: In March 2015, Jet.com hired Liza Landsman, former chief marketing officer of E*TRADE, to be its chief customer officer. She was tasked with handling the customer experience, including analytics, marketing, and branding. 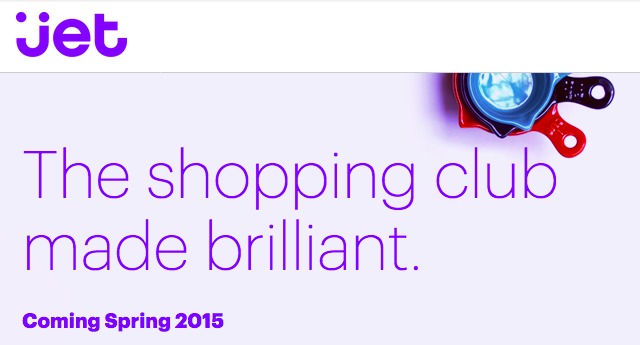 Screenshot of Jet.com in April 2015 via Wayback Machine. Beta launch - at one year and one month from founding: By May 2015, Jet.com was active for beta members, including friends and family, journalists, and people who had signed up for Jet Insider. An early review of the service by GeekWire praised the service for its fast shipping speeds, low prices, and great customer service but found fault with the limited selection. For example, the dishwasher detergent section only offered 38 options versus 2,416 on Amazon. Launch - at one year and three months from founding: In July 2015, Jet.com officially launched to the public with an inventory of 10 million items. At the time, 2,200 retailers had agreed to to sell through Jet.com, including NewEgg, Barnes & Noble, and Lenovo. Additionally, the company said it had spent $40 million of its investments on inventory, hiring more than 300 employees, and opening warehouses in three states (Kansas, Nevada, and New Jersey). Jet.com also had plans to spend $100 million on ads to gain new customers. At the time of its public launch, Jet.com had amassed 100,000 customers through its pilot program. In its first 24 hours, Jet.com hit $1 million in sales. New business model - at one year and six months from founding, three months from launch: In October 2015, Jet.com dropped the membership fee, allowing anyone to shop the company's marketplace. Instead of seeing savings from 8-15 percent, consumers on the site would see savings of about 4-10 percent, depending on how they used the site. In the three months since launch, Jet.com had grown to 760,000 customers and hit $20 million in gross sales in September. Fourth funding - at one year and seven months from founding, four months from launch: In November 2015, Jet.com secured $350 million in new funding along with verbal agreements for another $150 million. The round was led by Fidelity with participation from Alibaba, Bain Capital Ventures and Google Ventures. New ad agency - at one year and nine months from founding, six months from launch: In January 2016, Jet.com hired Maxus to fuel the company's growth through advertising. The company said it planned to spend $80 million annually on multichannel media. Acquisition - at one year and 10 months from founding, seven months from launch: In February 2016, Jet.com acquired Hayneedle, a home goods e-commerce company. Terms of the deal were not disclosed, though Forbes later pegged the sale price at $90 million. Traction - at two years and one month from founding, 10 months from launch: In May 2016, Jet.com started testing grocery delivery in New York City, New Jersey, Washington D.C., Connecticut, and Pennsylvania. At the time, the company was said to be valued at $1.3 billion. Exit - at two years and four months from founding, one year and one month from launch: In August 2016, Walmart purchased Jet.com for $3 billion in cash plus up to $300 million in shares for the founders and other employees. The deal officially closed in September 2016. 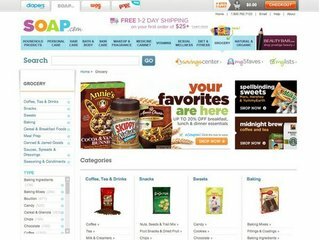 Even as a part of Walmart, Jet.com has continued to snap up smaller online retailers. In January 2017, the company acquired ShoeBuy, an e-commerce site dedicated to shoes, for $70 million. And last month, Jet.com purchased ModCloth, an online retailer offering indie and vintage-inspired women's clothing, for somewhere between $50 and $75 million. 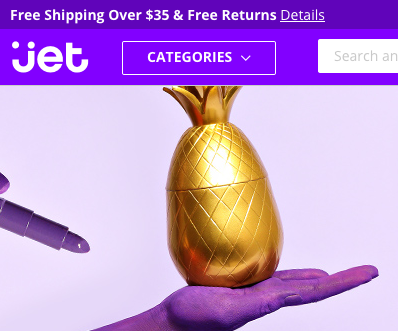 Today, Jet.com has X customers and a marketplace offering Y goods. The company's revenue is Z.